I’ve been interning at Glencroft for a few weeks now, so we thought it might be nice to write a blog for our customers (old and new) who are using our new website to give you a behind-the-scenes view of how the business works. First of all though, I should introduce myself. My name is Beth and I’m a second-year history student and like pretty much all humanities students, I’ve ended up doing something completely unrelated to my degree. My official role here at Glencroft is “Brand and Marketing Intern”, but really I get to do a bit of everything, which is great because it means I get plenty of experience for the future. I particularly enjoy the more creative aspects of my role, like being able to write this blog or writing descriptions for some of our products on the website. The first impression I got of Glencroft really came from where it was based, up in Clapham (no, not that one) in North Yorkshire. It really is one of the most beautiful villages I’ve ever seen. It’s full of little chocolate box cottages with a community who are always on hand to help a neighbour in need. It’s very rural, with a river (the Clapham Beck) and waterfall running through its centre and it has the beautiful backdrop of Ingleborough hill, one of the three peaks. For anyone who could make the trip, and particularly any walkers amongst you, I really would recommend coming up to the village just to have a wander. Glencroft’s sheepskin rugs add that extra touch of homeliness to a Clapham garden room. The Clapham Beck runs through the centre of the village. 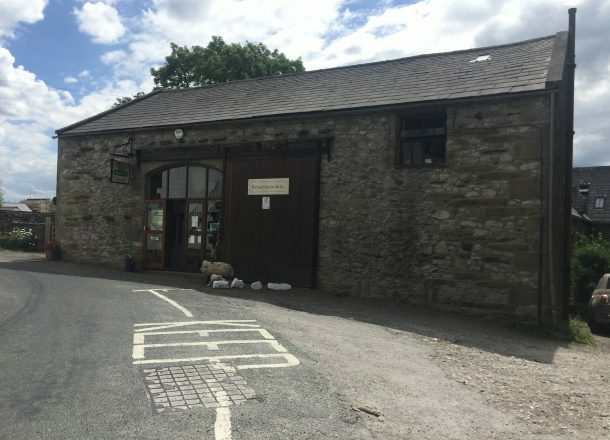 Glencroft itself is based in a 300-year-old converted cow barn which acts as both a factory shop for those passing through the village and as a warehouse for all the goods you end up buying online. You can’t miss it, it’s just on the edge of the village across from the pub. It’s been especially nice this last week because the age of the building means that it’s still pleasantly cool even during this bizarre heatwave. Glencroft is based next to our local pub, of course. All of your orders are sent from our warehouse in Clapham. One of the greatest challenges I found when I started was trying to learn the stock and then where all the stock was kept, because we hand pick and pack all of the items that you order. Richard, Justina and Edward all seem to know the stock like the back of their hands, but then that does tend to happen when you’ve built up a family business from scratch over the past 30 years. I do think I’m getting better at knowing most of the stock, but sometimes it’s best to double-check that you’ve pulled out the exact breed, colour, and size of sheepskin rug ordered (who knew sheep were such a diverse bunch!). So far then, I’m really enjoying it and settling into my role a little more. I’m learning new things pretty much everyday, especially to do with running the website, which I’m sure will come in very handy in the future as e-commerce becomes a bigger and bigger part of business. Everyone has been so kind and welcoming and I’m looking forward to spending the rest of my summer up here!